The calendar provides this week a perfect excuse to reconsider Geri Allen (whose superb new suite for jazz piano, Flying Toward the Sound, I took up here recently) in the context of her great precursor, Mary Lou Williams. This Saturday, May 8, is the hundredth anniversary of the birth of the pianist and composer who stands out as Allen's deepest influence, despite the fact that Flying Toward the Sound is a tribute to Cecil Taylor, McCoy Tyner, and Herbie Hancock. 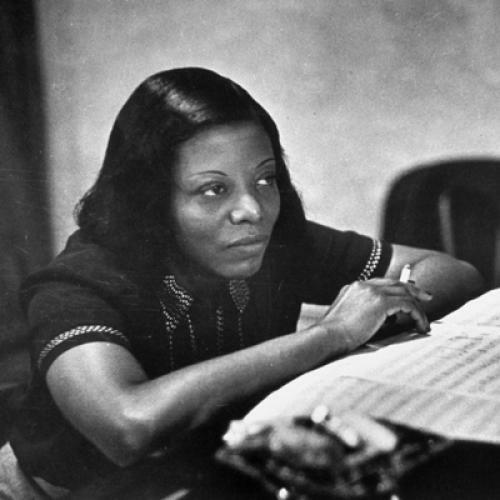 Allen has made clear her deep admiration for Williams in many ways, among them her key participation in the Mary Lou Williams Collective, a group founded through the Williams Foundation to preserve Williams's legacy by performing and recording works from her vast and still underappreciated repertoire of original compositions and arrangements. (Allen seems to have a gift for turning institutional largess to worthy advantage.) A few years ago, Allen led the Collective in a respectful, but not worshipful reworking of Williams' early experiment in long-form jazz composition, The Zodiac Suite (released on CD as The Zodiac Suite Revisited). Allen has also composed a lovely piece dedicated to Williams—"Thank You Madam," a luxurious ballad included in the Revisited CD, and she even portrayed Williams in Robert Altman's 1996 ensemble film about ensemble music, Kansas City. Williams, who started working professionally as a vaudeville pianist at the age of 15, drew from every musical style she encountered in her long career, and she helped invent two genres: long-form jazz and jazz sacred music. In one performance of "The Man I Love" (at the Montreux Jazz Festival, just three years before her death in 1981), we see Williams presenting and upending the whole history of jazz piano, very much as Geri Allen is doing today.